Nearly 10,000 people have paraded in Mexico City dressed as zombies in what organisers claim is the biggest "zombie walk" ever held. Wearing ghoulish make-up and rags splattered with fake blood, the "undead" shambled and groaned through the heart of the capital. The current Guinness world record is held by Asbury Park in the US, where 4,093 zombies marched in 2010. Zombie walks have grown in popularity worldwide in recent years. 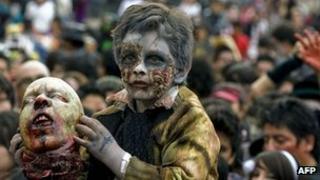 The craze for dressing up as the "living dead" has been fuelled by movies, television, video games and literature. A group in Brisbane in Australia has also laid claim to the record after massing 8,000 zombies last month. Cultural critics have variously suggested the phenomenon may be linked to economic austerity or a critique of consumerism. But participants usually say they are doing it for fun. Correspondents say the craze has particular resonance in Mexico, where the "Day of the Dead" is a national celebration and where brutal killings by drugs gangs dominate the news. Elsewhere in Latin America, Lima in Peru, Santiago in Chile and Sao Paulo in Brazil have all staged zombie walks this year.